Rear-end collisions occur when one vehicle is following another and fails to slow or stop before hitting the rear of the vehicle in front. Rear-end accidents are one of the most common types of crashes. A rear-end collision occurs in the U.S. about once every eight seconds. This means that there are about 2.5 million rear-end crashes each year, according to the National Highway Traffic Safety Administration (NHTSA). Occupants of both vehicles may be hurt in a rear-end accident. Even when these types of accidents occur at low speeds, they can still cause very serious injuries. Drivers and passengers hurt in an accident should seek help from an experienced car accident lawyer who can help them enforce their legal rights to compensation from the driver responsible for the accident. 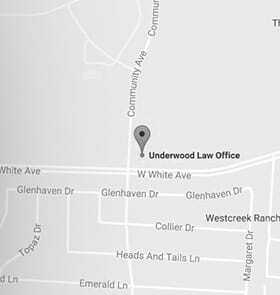 At Underwood Law Offices, our car accident lawyers have extensive experience handling rear-end collision cases. If you were hurt in such a crash or if your loved one was killed in a rear-end accident, contact us to learn how we can assist you in making a claim for damages. NHTSA indicates that rear-end collisions account for between 20 and 30 percent of all car accidents in the United States. In almost every case, these accidents happen because a driver does not leave enough space between his or her car and the vehicle in front. Drivers are expected to maintain a safe following distance, which is usually defined as a two-to-four-second gap. This means that if the vehicle in front passes a fixed object, the vehicle behind should not pass that same object until about four seconds later. Leaving this much distance between cars should allow the vehicle at rear to stop before striking the lead car, even if the lead car has to stop short. Since drivers in the vehicle that is following have better control over how close they are to the vehicle in front, these drivers are almost always considered to be at fault in a rear-end collision. This means that the driver in the front can usually take legal action to hold the driver at rear responsible. It is harder for the rear driver to recover against the driver of the lead car since the rear driver is presumed to be at fault for the accident. However, there are narrow exceptions to this presumption. Distracted driving – Drivers who have their eyes and minds on something other than driving may not be able to respond to slowing or stopped traffic before hitting vehicles in front of them. Speeding – When a driver is going too quickly, it will take longer to stop, and there is a greater chance that the car will crash into vehicles in front. This can occur not just when a driver exceeds the posted speed limit, but also if the driver is going too fast to be safe given the current road conditions. Brake problems – When brakes fail, a driver may not be able to stop before hitting the car in front. This can happen for several reasons, including neglected maintenance, repair errors and bad design of the brakes. Trucks are especially susceptible to brake problems because their air brake systems require more maintenance and adjustment. Weather conditions – Slippery roads and poor visibility can significantly increase the chances of a rear-end crash. Drivers should slow down and increase their following distance when fog, snow, ice, rain, glare or other dangerous conditions are present. Sudden lane changes – When a driver suddenly changes lanes – often called “cutting off” – or pulls out in front of traffic, the driver of the trailing vehicle may not have time to react before hitting the car in front. Failure to signal – When the driver in front fails to signal a turn and then slows down or stops in order to make the turn, the driver at rear may hit the car in front. Faulty brake lights can also cause a crash under similar circumstances. Stopping short – If the driver in the lead car slams on the brakes, especially at an unexpected location or for no apparent reason, then the rear vehicle may hit the car in front. Rear-end collisions commonly lead to whiplash, back injuries and fractures. These types of injuries can occur even in a low-speed crash. Getting full compensation after a rear-end accident is essential so you can have your bills and losses covered. You should be compensated by the driver who caused the crash for your medical bills, lost income, pain and suffering, emotional distress or the wrongful death of family members. An experienced accident lawyer can help you avoid getting less than you deserve because of the dishonest tactics of insurance companies. At Underwood Law Offices, our dedicated car accident attorneys have extensive experience with rear-end crashes. We can help you to gather evidence to prove who was to blame for the accident. We can also help you demonstrate the extent of your injuries. The rear-end crash attorneys at Underwood Law Office are ready to help you recover the maximum compensation available for your injury case. Call our toll-free number 844.UNDERWOOD (844.863.3796) for a free consultation about a fair settlement. You pay no fee unless we win. Se Habla Espanol. There is no charge for the call or the claim evaluation, and there are no strings attached.